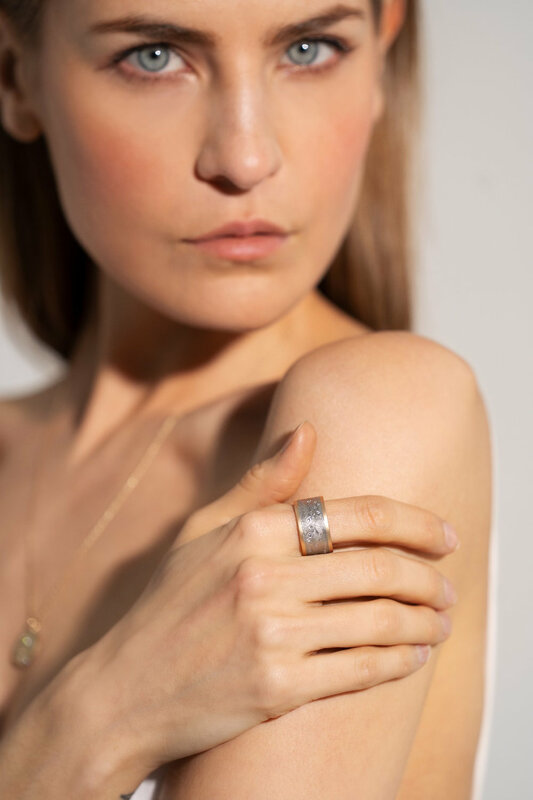 The Rising Tide Ring, sustainably made by Steven Jacob, donated to the Pure Earth Pure Gold Auction to raise awareness of sustainable jewelry making practices and the importance of clean water. BOULDER, CO, USA (March 28, 2019) — The Rising Tide Ring created by Steven Jacob was specially designed for the Pure Earth Pure Gold Auction to celebrate and encourage the raising of awareness for sustainable jewelry practices and be a visual reminder of the importance of clean water. Designers contributing to this year’s collection for the Pure Earth Pure Gold Auction are leaders in their field and strong advocates for responsible gold. The auction is live online until the Pure Earth Benefit Bash in NYC on April 8, 2019. Pure Earth, a nonprofit leader in global pollution cleanup, is teaming up with the Model Mafia, a collective of activist models brought together by Cameron Russell and Áine Rose Campbell, to raise awareness and fight pollution in the fashion industry and beyond. As a small, Damascus steel and mokume gane jewelry design company, the Father and Son team, Steve Midgett and Jacob Midgett respectively, hold high standards for their jewelry as well as for their production and sourcing practices. Recognizing the opportunity to act as a small handcrafted jewelry maker, Steven Jacob are always looking for ways to improve on the sustainability of their practices. One way they do this is by committing to use 100% recycled precious metal and supporting environmentally focused organizations with like-minded initiatives, contributing to a louder voice for better practices in the jewelry industry. The Rising Tide Ring Made of 100% recycled gold and repurposed steel, is adorned with 32 VS clarity Canadian Fair-Mined diamonds. 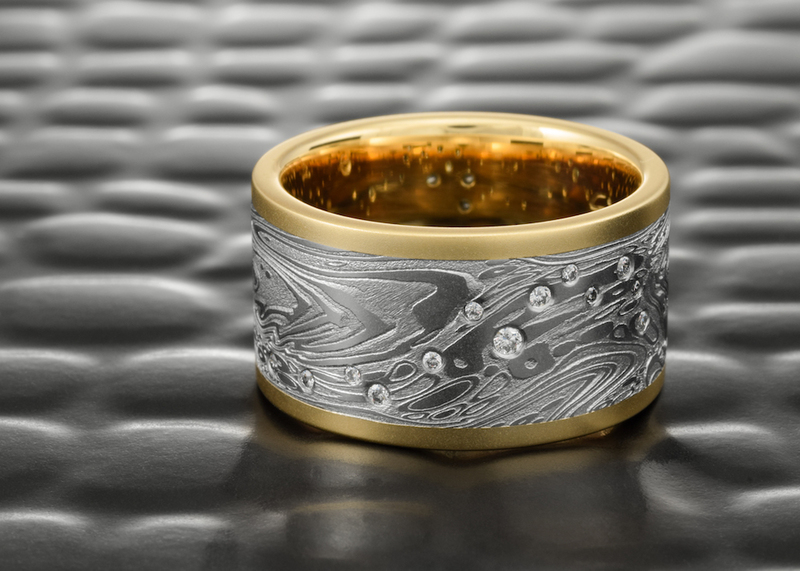 Based off of Steven Jacob’s Tidepools pattern, which mimics the swirls of water pools in natural streams, the ring is 11mm wide and a size 7.5. “Many in the jewelry business have followed traditional methods that can be very detrimental to the environment. I’m so happy to see my son changing the narrative by setting greater sustainable standards for our business. I’m proud of him and what we have built” said Steve Midgett, Co-Founder of Steven Jacob. At the heart of all Steven Jacob designs are the metal lamination and patterning techniques of Mokume Gane, (Japanese for woodgrain metal) and Damascus Steel. Both are ancient forging techniques that create beautiful patterns which mirror those found in nature. On the ground, Pure Earth has been working to reduce and prevent toxic mercury pollution in artisanal gold mining communities in Peru, Indonesia, Mongolia, and other countries. Pure Earth works to raise awareness among miners and their families about the dangers of mercury, train miners in mercury-free mining techniques, and work with local governments to scale up sustainable mining practices. 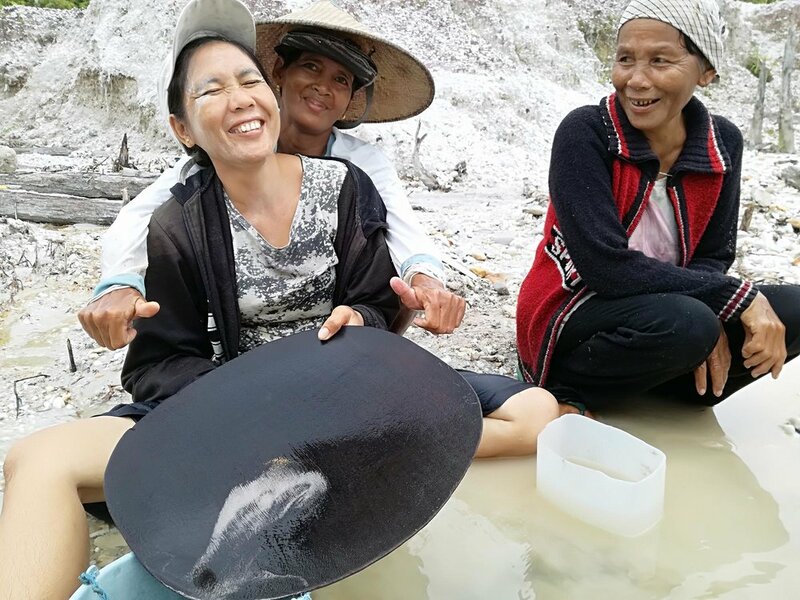 Women miners in Indonesia using traditional mining methods. Pollution is the largest environmental cause of premature death and disease in the world today. It causes 3Xs more deaths than HIV/AIDS, TB and malaria combined, and 15Xs more deaths than war and all forms of violence. This was confirmed in a report released in 2017 by the landmark Lancet Commission on Pollution and Health. This month, the UN released the latest Global Environmental Outlook report concluding that environmental damage is behind 1 in 4 deaths worldwide. Another report, Pollution Knows No Borders, shows how toxic pollution travels from country to country, not only in the air and water, but also in the food and products we buy. About 10% to 25% of the world’s total gold supply comes from artisanal gold mining. Artisanal and small-scale gold mining is the leading cause of mercury pollution in the world, accounting for over 30% of global emissions, making it one of the world’s worst pollution problems. Artisanal gold miners work in dangerous conditions to earn a meager living. To help them extract small grains of gold from ore, miners add mercury, which binds with the gold to form an amalgam. When burned, the toxic mercury evaporates into the atmosphere, leaving behind gold. Artisanal miners (including some 4.5 million women) and their families are often the first to suffer from mercury poisoning, but everyone is threatened because mercury travels far and wide, dropping into oceans and rivers, poisoning seafood we all consume. Today, an estimated 19 million people are at risk of mercury poisoning. Children and pregnant women are especially vulnerable. Mercury attacks the central nervous system and many organs. It passes through the placenta and travels into developing fetus, causing birth defects and brain damage. Increasing demand for mercury-free gold will help more artisanal miners to go mercury free, ensuring their livelihoods while reducing mercury emissions. Steven Jacob is a custom jewelry maker based in Boulder, Colorado. Steve Midgett, Father of the father/son duo is an internationally recognized master of Damascus Steel and Mokume Gane. His fascination with these techniques spans four decades, and he has specialized in patterned metal jewelry since 1989. Jacob Midgett, Son of Steve, has spent his life around Mokume, frequently using leftovers from Steve’s work to create objects for friends. After studying Industrial Design at the Savannah College of Art and Design, the pair teamed up to create Steven Jacob Jewelry, applying Steve Midgett’s lifelong craft to jewelry design. Pure Earth’s mission is to identify and clean up the poorest communities throughout the developing world where high concentrations of toxins have devastating health effects. Pure Earth devises cleanup strategies, empowers local champions, and secures support from national and international partnerships. Interventions to mitigate these toxic exposures while protecting livelihoods have proven to be manageable, cost-effective, and eminently do-able. By partnering with and empowering local champions, we clean up chemical and waste legacy toxic hotspots, prevent re-contamination and guard against future pollution. In 2019, Pure Earth marks 20 years as the leading NGO working on cleaning up toxic pollution in poor countries.